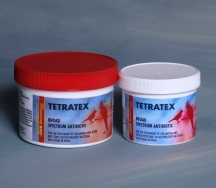 TETRATEX is a broad spectrum antibiotic used for the treatment of chlamydia and other intestinal or respiratory bacterial infections in birds. Enclosed scoop holds one level teaspoon. Add one level teaspoon of TETRATEX to 8 fluid ounces of clean drinking water for small birds (i.e. Parakeet, Canary, Finches) OR add two level teaspoons of TETRATEX to 8 fluid ounces of clean drinking water for large birds (i.e. Mynah). Use as the bird’s only source of drinking water. Use a fresh solution every day for seven days. 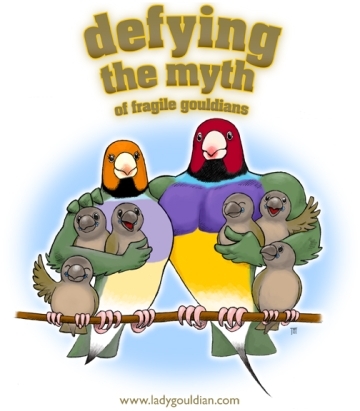 If the bird does not respond to treatment or if the bird’s condition worsens, consult a veterinarian. Keep stock solution covered in a dark refrigerator and discard after five days, Keep container closed before and after use. Store in a cool, dark place. Discontinue using any product containing calcium or iron while administering TETRATEX, unless Megamix is added to the same drinking water at a rate of 3ml per quart of drinking water. To reduce the development of drug-resistant bacteria and maintain the effectiveness of TETRATEX and other antibacterial drugs, TETRATEX should only be used to treat infections that are proven or strongly suspected to be caused by bacteria. Packaging: 3, 6 and 16 ounce jars.